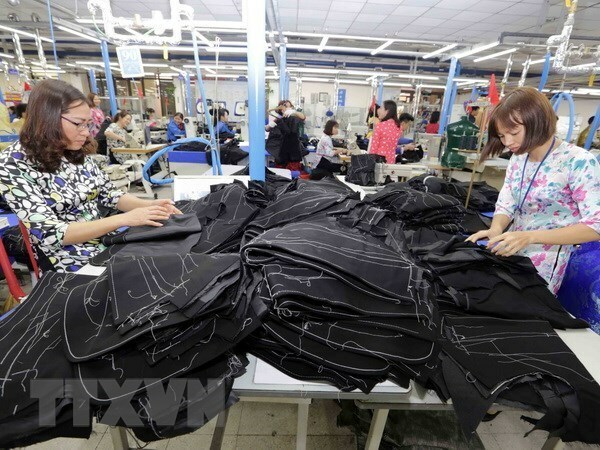 Hanoi (VNA) – The elimination of many tariff lines for goods under the Comprehensive and Progressive Agreement for Trans-Pacific Partnership (CPTPP) has helped Vietnam’s exports to Japan increase sharply in the first quarter of 2019, according to the General Department of Vietnam Customs. Vietnam's export value to Japan in the first quarter surged 6.7 percent year on year to 4.6 billion USD, helping the country to become one of three markets gaining an export value in billions of US dollars to Japan, after the US and China. In March 2019 alone, the export value to Japan reached 1.7 billion USD, a sharp increase of 62.3 percent month on month and a surge of 2.7 percent year on year. The strong growth in Vietnam’s export value to Japan was attributed to the CPTPP. According to this agreement, Japan for the first time has pledged to completely eliminate tariffs for the majority of Vietnam's agricultural and seafood products exported to this market. That meant Japan immediately abolished 86 percent of tariff lines, equivalent to 93.6 percent of Vietnam's export value to Japan, and then this figure will increase to 90 percent of tariff lines within five years. On the other hand, the Vietnam-Japan and ASEAN-Japan free trade agreements have created advantages in tariffs for some of Vietnam's seafood products exported to Japan. About 62.5 percent of Vietnam’s total goods items exported to Japan in the first quarter gained strong growth compared to the same period last year, according to the general department. The major export products to Japan included textiles (export value of about 900 million USD), means of transport and spare parts (630 million USD), machinery and equipment (450 million USD) and seafood products (306 million USD). Especially, Vietnam’s fertiliser exports to this market had a sudden growth in the first quarter of 2019 to 8,126 tonnes, earning 3.7 million USD. The exports rose up by five times in volume and about 11 times in value year on year. In addition, Vietnam saw strong growth in exports of some goods to Japan in the first quarter, including chemical products (up 70 percent), animal feed and raw materials (up 56.8 percent), ore and minerals (up 52 percent), all kinds of steel (up 49 percent) and plastic materials (up 43 percent). Meanwhile, Japan sharply reduced imports of cassava and cassava products from Vietnam, with a reduction of 99.6 percent in volume and 98.5 percent in value over the same period, despite the average export price of cassava surging by 3.3 times to 886 USD per tonne.